We can’t say the result wasn’t unexpected. 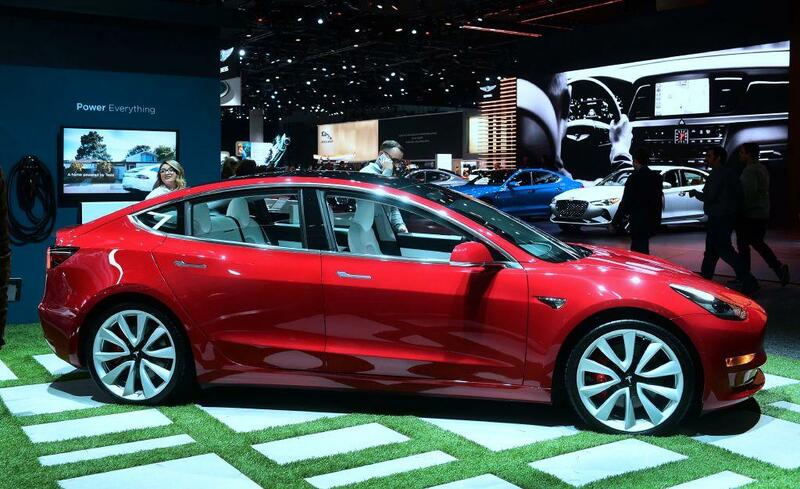 A production line Tesla Model 3 all-electric luxury sedan made a lovely Mercedes AMG CLS 53 mid-size luxury sedan and a mean-looking Dodge Challenger Hellcat with a supercharged V8 eat dust in an impromptu race held in the rarefied air of Denver, Colorado. Admittedly, holding a sprint at an altitude of 5,000 feet where the air’s thinner will leave any gasoline powered car gasping for breath, and therefore losing speed. It won’t be any problem for a Model 3 though, whose dual-motor engines deliver power to all four wheels and which doesn’t need to gulp masses of air to hit max speed. But the Hellcat did have four times more torque than the Model 3 while the Mercedes also beat the Tesla in this paper measurement of power. The race between father and son on YouTube's The Fast Lane Car shows the Tesla receiving a software upgrade prior to the race that boosted its power by five percent. A follow-up test after the update showed Model 3 a bit quicker with a 0 to 60 time of 4.42 seconds versus the original 4.59 second run. Note that the Tesla Model 3 in this race isn’t the higher-end performance model. Its engines generate only 367 bhp and owns a Tesla-advertised 0 to 60 time of 4.5 seconds. On the other hand, its competition was built for speed. The intimidating Dodge Challenger Hellcat with its supercharged V8 has 707 bhp under the hood. That’s enough to propel this monster to 60 mph in just 3.4 seconds. This V8 is the most powerful engine produced by Chrysler, and the most powerful production engine ever in a muscle car until the Dodge Demon came along in 2017. The 2019 Mercedes-AMG CLS 53 packs a boosted 3.0 liter inline six good for 429 bhp. Its published 0 to 60 time is 4.4 seconds. On stats alone, the Hellcat is the clear winner -- if the race were held at sea level, which it wasn’t. Another factor against the fossil burners is the IMI Motorsports Complex north of Denver doesn’t have a dedicated quarter-mile drag strip. Pundits point out that the deck is stacked against the Hellcat. The best thing about the Hellcat, however, was that powerful roar from its angry V8. In other words, the Hellcat lost badly to the Tesla. As did the Mercedes-AMG. Chalk-up the Model 3’s win to the tremendous acceleration any electric vehicle can generate simply by flooring the accelerator pedal. No messy gear changes. No lost time. Just pure speed.